Developing scissor skills is a vital part of fine motor development. Learning to cut with scissors will strengthen your child’s hand muscles and will also help your child to learn to use the thumb, index and middle fingers together. These are the “tripod fingers” that are used to hold and control a pencil when writing. This is why scissor cutting can be considered a “pre-handwriting” skill. 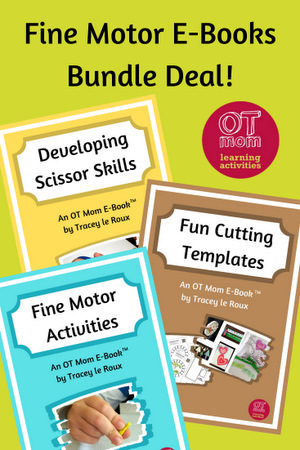 In this OT Mom E-book, I will show you what good scissor cutting skills look like, and will also show you the common mistakes that kids make when learning to cut with scissors. I will then give you suggestions to follow to develop your child’s cutting skills. This e-book is intended to encourage your child's normal development. If you suspect your child has any delays, please seek a professional opinion. How were these activities chosen? Introduction: 2 pages of vital information on cutting with scissors. A scissor cutting checklist to help you analyze your own child’s cutting skills, plus 4 pages of poor techniques (photographed) that kids sometimes use. 6 pages packed with photographed activities that will help your child develop scissor cutting skills: first the grasp/release motion, and then learning to cut on a line. 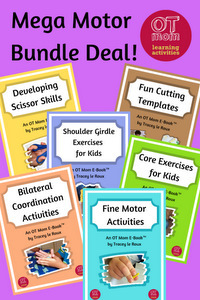 Appendices: 3 pages of bilateral coordination activity ideas and 2 pages of fine motor tips. 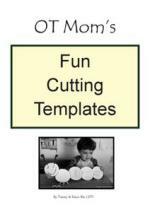 This mini-e-book contains printable templates that can be used to help your child learn to cut! Fun Cutting Templates includes the free lines and basic shapes found on my site, but also contains exclusive bonus templates and photographed directions for a giraffe, a rocket, a boat, a castle and more! In order to develop good cutting skills, your child first needs to develop the grasp/release motion of the scissors, and then to cut on a line. The activities in this e-book will help your child to develop these skills. If your child struggles to manipulate the paper while cutting with scissors, then bilateral coordination skills may be poor. For this reason, I include 3 pages of bilateral coordination activities that can easily be done at home. Quite a few of the activities and tips in the e-book are available for free if you browse through my website, but some of the content is exclusive to my e-book customers. If you need free scissor cutting advice and activities, click on the Cutting Skills tab on my nav bar and dig deeper into my pages to get my the free info and tips. However, this e-book is a great way for you to have all the activities, tips, templates and more, in an accessible format! While working as a pediatric OT, I had years of experience working with kids in private practice and local schools as well as in low-income communities. Many of those children struggled with fine motor tasks, and these scissor skills activities have been beneficial in helping them develop their scissor cutting skills. As a homeschooling mom on a tight budget, I make a point of choosing activities that can easily be done at home with inexpensive everyday resources. As with all the activities on my website, real-life photos accompany the instructions. Use your credit card to pay through PayPal, or use your PayPal account. My e-books are not free as I need a source of income to maintain this website. I have kept the prices as low as possible, but if you genuinely cannot afford an e-book, and need more than the free resources I already offer on my site, then feel free to contact me to explain your situation. I invite you to explore the free scissor skills information and cutting activities on my website if you need free information or a sample of what I offer. 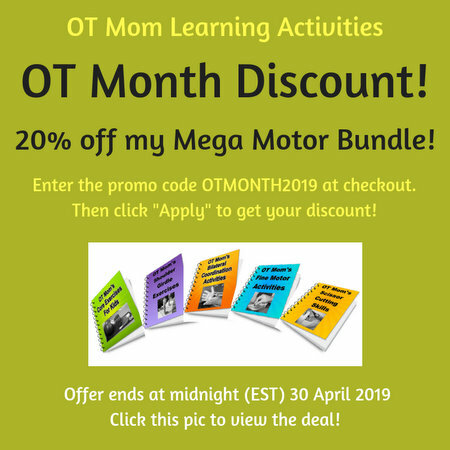 Thank you for your interest in my OT Mom E-Books!